PSIKIYATRIDE GUNCEL YAKLASIMLAR - CURRENT APPROACHES IN PSYCHIATRY publishes review articles relevant to psychiatry and related sciences (i.e behavioral sciences, psychology, psychopharmacology, neuropsychiatry, neurosciences, psychiatric nursing) both in Turkish and in English. Journal also publishes one research only special issue every year. The journal accepts articles on not only current subjects but also on classical subjects to become an educational source for all psychiatric residents, specialists and related professionals. The journal is currently published quarterly (four issues on March, June, September, December) comprising one volume per year. The submitted manuscripts will become freely available to all readers in pdf format in its web site (www.psikguncel.org) as soon as they have been accepted after peer review. Accepted articles will immediately appear as a part of the journal issue belonging to that publication period. In addition to standard issues which are composed of only review articles, every year (volume) journal publishes a special issue which includes only research papers. PSIKIYATRIDE GUNCEL YAKLASIMLAR - CURRENT APPROACHES IN PSYCHIATRY , the Publisher, and the Editors assume no responsibility for the statements in the articles; authors carry the scientific and legal responsibilties of their own articles. The manuscript which is submitted to the journal must not contain previously published material or material under consideration for publication elsewhere. Accepted manuscripts become the property of PSIKIYATRIDE GUNCEL YAKLASIMLAR - CURRENT APPROACHES IN PSYCHIATRY and may not be republished. The journal does not charge any article processing or submission fees to authors. As a first step, manuscripts received are evaluated with regards to the instructions to authors. The approved articles are delivered to Editorial Board. The Editorial Board evaluates the context of articles and sends them to two referees in related fields. A final review and a subsequent decision relative to publication will then be made by the editor of PSIKIYATRIDE GUNCEL YAKLASIMLAR - CURRENT APPROACHES IN PSYCHIATRY . The articles which are accepted by the Editorial Board, come in the list of publication and the authors of these articles are informed. This journal uses double-blind peer review, which means that both the reviewer and author identities are concealed from the reviewers, and vice versa, throughout the review process. To facilitate this, authors need to ensure that their manuscripts are prepared in a way that does not give away their identity. All manuscripts submitted are checked for plagiarism with Ithenticate software to ensure the originality, and to detect instances of overlapping and similar text in submitted manuscripts . All manuscripts should be submitted via online submission system. All other correspondences should be addressed to Lut Tamam , MD Editor-in-Chief [PSIKIYATRIDE GUNCEL YAKLASIMLAR - CURRENT APPROACHES IN PSYCHIATRY ] via e-mail editor.cap@gmail.com. All manuscripts written either in Turkish or English are welcomed. However, starting from 4 th issue of 2018, authors of Turkish manuscripts are requested to send English (or Turkish) version of final accepted manuscripts. For manuscripts from authors of other nations, all Turkish translation services will be provided by journal do no additional cost. By submitting a manuscript for publication, each author acknowledges having made a substantial contribution in the conception and design of the study, the analysis and interpretation of the results, and the writing of the paper, and has approved the final submitted version of the paper. Each author thus also acknowledges responsibility for the integrity of the manuscript, assures the originality of the manuscript, and guarantees that duplicate or redundant publications or submissions have not occurred. The Editors reserve the right to request the original data obtained in the investigation. Authors are responsible for all statements made in the text. The publication of an article in a peer reviewed journal is an essential model for our journal "Psikiyatride Guncel Yaklasimlar-Current Approaches in Psychiatry". It is necessary to agree upon standards of expected ethical behavior for all parties involved in the act of publishing: the author, the journal editor, the peer reviewer and the publisher. The editor is responsible for deciding which of the articles submitted to the journal should be published. The editor may be guided by the policies of the journal's editorial board and constrained by such legal requirements as shall then be in force regarding libel, copyright infringement and plagiarism. The editor may confer with other editors or reviewers in making this decision. These instructions are based in part on recommendations in the Uniform Requirements for Manuscripts Submitted to Biomedical Journal [Ann. Intern. Med. 1997; 126:36-47]. 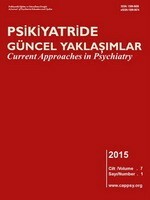 Variations from guidelines in this publication reflect the individual style of PSIKIYATRIDE GUNCEL YAKLASIMLAR - CURRENT APPROACHES IN PSYCHIATRY. The authors should: Submit an electronic version of text (as a MS WORD document),unlabeled and labeled images (as JPEG files). Prepare a copyright transfer form signed by all authors. Unless otherwise specified, written communication will be carried on with the first author, at all. The intention of having the disposed paper to be published in our Journal as well as the preferred section (research, review, case reports or letter to the editor) should clearly be indicated in the paper. Margins of the text should be 2 cm from the page border and line spacing should be 2 lines. While the article is submitted online, name and academic title of the authors; postal address, e-mail address, phone & fax numbers of the correspondent author and personal acknowledgements should be registered in Dergipark online article system. However, the cover page that consists author name and affiliations should not be included in the word document of submitted article because the word document of the article submitted to the System will be automatically transformed to pdf format and sent to the reviewers. Keep acronyms and abbreviations to a minimum.When an abbreviation is used, define it at first mention and follow with the abbreviation in parentheses. The author(s) is free to design the paper. There is no limitation in the page number in this category. References, figures, and legends follow the guidelines described below. The Abstract section is needed. The following information should appear: title of article; authors' name, and last name; affiliations, grant support, and presentation in part or whole at any meeting. Identify the Corresponding author and provide full mailing address, phone and fax numbers, and e-mail address. The abstract should be provide both in English and in Turkish and should include maximum 250 words. It should describe the essential aspects of the paper. No references should be cited. No abbreviations should be included. Five keywords should be provided. Unstructured format should be applied in abstract of reviews. Include brief background information on the subject. The gain of this review article to the literature may be described as a last sentence. This section may be divided into subsections if it facilitates reading the paper. If tables and graphic material will ease the understanding of the review, include them. In appropriate place, cite figures and graphs. In a separate section, summarize the major points of the review. Acknowledgments should appear on a separate page. 1. There is no limit on the number of references. 2. Each Section must begin on a separate page. 3.References should be clarified in the text with the name of the author and publication year. There should not be a comma between the name and date. a. If there are more than two authors, they will be expressed as "(the name of the first author) et al. ", but if there are two authors, both of them will be written. b. If one author published multiple manuscripts in the same year, they should be clarified as (Freud 1915a), (Freud 1915b). c. If there are more than one references in a certain point, they will be expressed in the same paranthesis seperated from each other with commas in a chronological timeline. 4. References should be seperately presented at the end of the text in an alphabetical list. 5. Surname(s) and initial(s) of name(s) of the author(s) will be written without commas or dots. If there are more than six authors of a reference, the others will be mentioned as "et al." phrase. Then, publication date of the reference will be written in parantheses. 6. Papers submitted but not yet accepted for publication should not be cited in the text. 7. Inclusive page numbers (e.g., 491-492) must be provided for all references. Ekici G, Altuntas B, Goz H, Caylak H, Sapmaz E, Isik H et al. (2009) Bronkoselin eslik ettigi bronkosel olgusu. V. Turk Gogus Cerrahisi Kongresi, 14-17 Mayis 2009 Kusadasi,Turkiye. Congress Presentation Book pp.93-98. Phillips MK, Gain P (1985) Hypertension and stroke. In Hypertension: Pathophysiology and Management, 2nd ed (Eds JH Laragh, BM Brenner):495-498. London, Ran Press. Savas MN (2005) Preoperatif kemoterapi ve Beta Glukan brons anastomozuna etkisi (Masters Thesis). Konya, Selcuk University. Stern M (2000) Radial nerve entrapment. http://www.emedicine.com/orthoped/topic549.htm (retrieved Dec 11, 2005). Format: Author, if available. Title of page as listed on the site. Address of page (date retrieved). 1. Each table should be given on a separate page. 2. Each table has a short, descriptive title. 3. Tables are numbered in the order cited in the text. 4. Abbreviations are defined as footnotes at the bottom of each table. 5. Tables should not duplicate data given in the text or figures. The complete sets of original figures must be submitted. Legends should be in the present tense (e.g., Illustration shows ...). Subjects' names must not appear on the figures. Labels should contrast well with the background. Images should be uniform in size and magnification. Illustrations should be free of all identifying information relative to the subject and institution. Line drawings should be professional in quality. Written permission for use of all previously published illustrations must be included with submission, and the source should be referenced in the legends. Written permission from any person recognizable in a photo is required. Legends must be double spaced, and figures are numbered in the order cited in the text. Submit color prints only if color is essential in understanding the material presented. Label all pertinent findings. Research articles report substantial and original scientific results within the journal scope. Research articles comprised of abstract, keywords, introduction, material and methods, results, discussion, references and table/figures. The abstract and body text must be structured as explained above. Ethics committee approval and informed consent must be obtained and indicated in research articles. On the title page, include full names of authors, academic or professional affiliations, ORCIDs and complete address with phone, GSM and e-mail address of the corresponding author and disclosure of any commercial or financial involvement. Abstract must consist of 250 words and must be structured as objective, method, results and conclusion. “Objective” must explain the main/primary aim of the paper. “Method” must provide data sources, framework of the study, patients/subjects, visits/assessments and primary measures. “Results” must be structured so as to present direct clinical practices and interpret the results. “Conclusion” must provide the conclusions derived from the study. Three to five keywords should be given underneath the “abstract” and they must be in accordance with National Library of Medicine’s Medical Subjects Subheadings (MeSH). For abstracts are most distinct parts of an article and take place on the electronic databases, author should be sure that abstract represents the content of the article accurately. The importance and history of the subject as well as the published studies, hypotheses and the objective of the study should be mentioned in the “Introduction”. Data sources, hypothesis of the study, patients/subjects, scales, visits/assessments and primary measures, process steps and statistical methods should take place in the “Method” section. The complete statistics of primary observations should visually be given in appropriately designed tables, graphics and figures, in the “Results” section. In the “Discussion” section, findings of the study as well as supporting and non-supporting (established hypothesis) observations and results should thoroughly be investigated; compared to the observations and results given in the literature and differences should be explained, if any. Interpretations should be summarized in the last paragraph. Individuals who do not meet all the criteria of authorship or who make contributions in some other aspects must be listed in the “Acknowledgements” section. Letters to the Editor may be used to describe in an extremely brief manner either an observation of interest to our readers, an opinion relative to the PSIKIYATRIDE GUNCEL YAKLASIMLAR - CURRENT APPROACHES IN PSYCHIATRY, or constructive observations or criticisms of published material. Letters should be no more than two pages and should be submitted with a brief title. A maximum of four references may be included. Letters are published at the discretion of the journal and are subject to editing.